"There was no punches thrown, no face slapping, no digs, and no nothing else. Just handbags. End of story." Pure gold. Corbyn just can't compete with these UKIP people. Congratulations to everyone who campaigned to keep the Nutt out of Parliament. 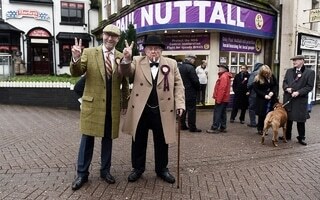 Let's hope UKip is about to implode. Good luck to Gareth, and I'm glad I could play a part in his victory. But, although 37% was enough on the day, it's really not enough. My fear (after researching and writing this post) is that May is in the process of consolidating the kind of 40+% Tory bloc, on the back of Labour exhaustion and division, which gave Thatcher her three victories. I'm also afraid that Blair is right about one thing - that funding the kind of public services we stand for will be ten times harder to achieve if Brexit goes ahead. On that basis alone I can't understand why the party's nodding through a hard Brexit; it seems guaranteed to give us the small state of Cameron's dreams. The issue's not going to go away, nor should it.